Glyphosate herbicide usage (as in Roundup) in the U.S. has increased dramatically over the last two decades, replacing the use of far more toxic herbicides on many crops. That’s one of the major points in a post at The Credible Hulk blog entitled “About those more caustic herbicides that glyphosate helped replace“. The increased use of glyphosate corresponded to heavier reliance on glyphosate-tolerant strains of genetically-engineered crops. The author provides charts and other details on the changing use of a number of different herbicides both over time and across crop varieties. The use of insect-resistant GE crops has also been associated with a declines in total pesticide use. [The links above are all given in The Credible Hulk post]. There is a great deal of distortion prompted by certain interest groups who oppose the use of synthetic herbicides and insecticides and GMOs. Irrational fears among consumers are inflamed by this sort of propaganda. This post and this post give farmers’ perspectives on some of the misinformation with respect to glyphosate. No, farmer’s do not “drench” their crops with glyphosate prior to harvest. That claim is pure hyperbole. It’s also important to note that organic crops are not free of treatments. So-called organic pesticides are often just as toxic as synthetic pesticides, and they are often used in heavier quantities. 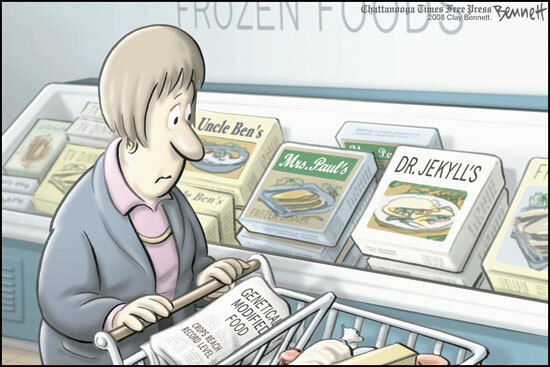 Furthermore, organic foods carry undeniable health risks to consumers. A balanced view must acknowledge the benefits of crop treatments to consumers (whether the treatments are organic or nonorganic), that residues on produce in the U.S. are minimal, that safety still dictates that consumers wash their produce, and that consumers deserve a free choice between crops grown conventionally or organically. It is likely that the additional flexibility for members to impose their own bans will lead to more flexibility in the process of authorizing new varieties at the centralized level. Contrary to much of the reporting offered by Greens, who would have us believe that GE crops are all but prohibited in Europe, there are many varieties of GE crops that are already authorized by the EU. If you don’t believe it, this database may convince you. Federalism is a good way to promote the union of sovereign entities with disparate views on a range of issues, such as agricultural practices. However, sustaining a federalist approach requires a determination to restrain central government bureaucrats and busy-bodies who cannot control their urges to control others. For the good of humanity, let’s hope the EU can succeed in this instance.